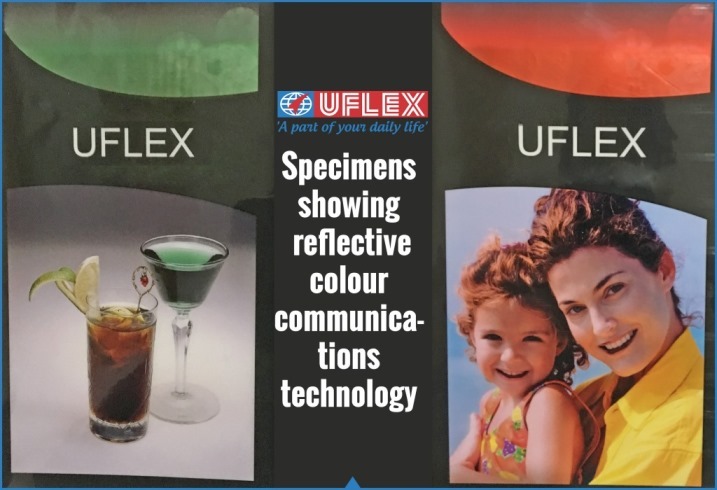 Getting a metallic sheen on a non-metallic substrate sounds rather uncanny, but owing to the reflective colour communication system offered by the Cylinders Business of India’s largest multinational flexible packaging materials and solution company Uflex, this has become a reality. Metallic effect on non-metallic substrates can be achieved by reflective colour communication technology that works in combination of a Specialised Pre Press Software and Special Laser Engraving Hardware. This effect is attained by manufacturing a special Rotogravure Cylinder (may or may not be in place of a white cylinder) that uses normal transparent gold/ transparent silver inks or lacquer inks. The customised software ensures that the dots are precisely distributed throughout the design so as to produce a homogeneous metallic effect which shimmers better than printing done by some of the costliest metallic inks on metallic substrates/laminates. Getting the same effect through specialized metallic inks can make conversion costs hit through the roof. Converters and brands stand to benefit with a perfect metallic sheen on a two ply laminate instead of three or more substrates as long as a barrier layer is not required (compulsorily) by the product to be packed. This special cylinder for metallic effect is manufactured as half tone image. Over and above this, if we eliminate the white printing cylinder (as white ink is opaque having solid pigment concentration) altogether, this arrangement translates to much less ink consumption which is a boon for the printer. These cylinders work just as fine on the existing printing machines thereby not requiring any modification or additional capital expenditure at the printer/converters’ end. This technology is adaptable for future substrates, inks and coatings.